Steve, did you guys relocate to the Springs during the night? Joe, are you out rearranging church signs again? Or did you just make a big donation at the church? 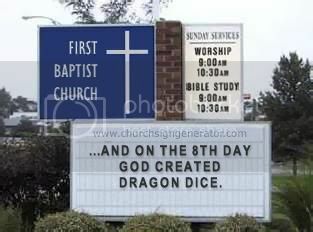 That must be the flagship church of my new denomination, the Baptist Gaming Convention. "We believe in Redemption...and Dragon Dice™, and Yu-Gi-Oh, and Hero Scape..."